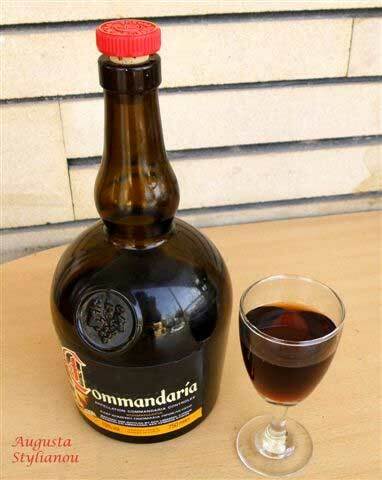 Commandaria (or Commanderia) is an amber-colored dessert wine made from the indigenous Mavro and Xynistery varieties of red grapes in the Commandaria region of Cyprus (centered near the city of Kolossi). It is an origin-controlled unfortified sweet wine with a natural alcohol content of 15%. It is usually aged in oak casks for several years, but does not need or benefit from additional aging once bottled. The wine has a rich history, said to date back to the time of the ancient Greeks, where it was a popular drink at festivals celebrating the goddess Aphrodite. A dried grape wine from Cyprus was first known to be described in 800 BC by the Greek poet Hesiod. In the 12th century (during the crusades), Richard the Lionheart is said to have enjoyed it greatly at his wedding in Cyprus and to have pronounced it "the wine of kings and the king of wines." Near the end of the century he sold the island to the Knights Templar, who then sold it to Guy de Lusignan, but kept a large estate—the Gran Commanderie—to themselves. This area under the control of the Knights Templar (and subsequently the Knights Hospitaller) became known as Commandaria. When the knights began producing large quantities of the wine in this region for export to Europe's royal courts, the wine became known by the same name. Thus it has the distinction of being the world's oldest named wine still in production. Oxford Companion to Wine, Ed. Robinson, Jancis, Oxford University Press, 2nd ed., 1999.